In MagicPlot Tables are used to store numeric or text data depending on column type (numeric/text). Data type is set for entire columns. One column may not contain data with different types. Empty cells are equivalent to Not-a-Number values. Values from text columns are treated as empty cells if used as numbers. 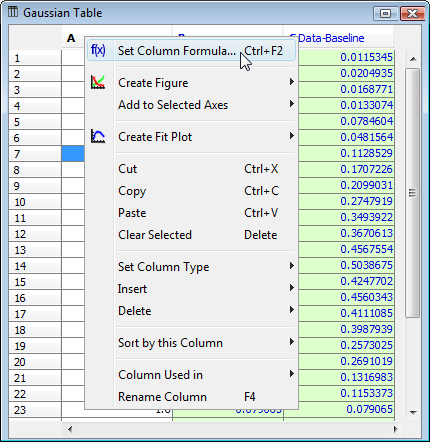 Table editing functions are available in table context menu (right click to open). Use Set Column Type menu in column context menu to change column type (numeric/text). Columns are enumerated starting with 1. The first 26 columns are additionally denoted with Latin letters: A, B, C, … Y, Z, 27, 28, 29, …. You can use either numbers or letters, addressing cells and columns in formulas. Double click on column header to rename table column. You can also use Rename Column context menu item or press F4. Hold Alt key (Option on Mac, Meta/Win on Unix-like) and drag column header to rearrange table columns. If Alt key is not pressed, mouse dragging on header will select the columns. You can edit table cell by double clicking on it. You can enter either a number or an expression (e.g. typing pi in a cell results in 3.1416…, typing 1+2 results in 3). See Formula Syntax section for expression syntax. To fit the width of one column, double click on right separator line in table header. To fit several columns widths, select multiple columns and double click on one of column separators in table header.